Potato and artichoke gratin is simple food, and deeply satisfying. Now that summer is in full swing, our CSA box positively overflows with vegetables and fruit: apricots, exotic mints, heirloom tomatoes, Malabar spinach, garlic, onions, parsley, salad greens, Swiss chard, leeks, summer green apples, artichokes and even tiny young potatoes. 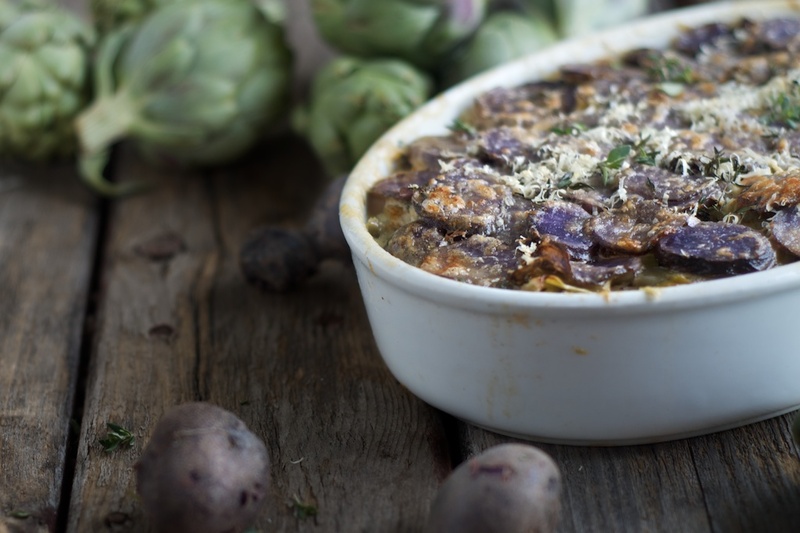 It’s with these – those artichokes and golf ball-sized purple potatoes – that I like to slice away and layer into a simple potato and artichoke gratin. The abundance of summer will wane soon enough. As soon as the leaves begin to turn, the wind takes a bit of chill, that bounty will fade into the sweet potatoes, dry beans, pumpkins and the storage crops that should last all of autumn, winter and into early spring again. For now, though, we indulge ourselves – stuffing our bellies full of vegetables at every opportunity and storing what we can’t eat through fermentation, freezing or drying. And that’s how we use up our CSA – and if you’re a CSA member, read more about what to do with what’s in your box. Unlike the goopy, overly cheesy gratins you find on restaurant menus and in dated cookbooks, a real gratin is simple fare: creamy, light and delicate. The cook simply layers vegetables – such as potatoes and artichokes – in an oblong dish, covers them with a mixture of stock and cream, and tops them with breadcrumbs, cheese or herbs. There’s no fussy bechamel, no flour, no corn starch, and just a dusting of grated cheese (if that). The vegetables simmer away in the stock and cream which thicken slightly in the oven, while the top of the gratin bubbles and turns golden. 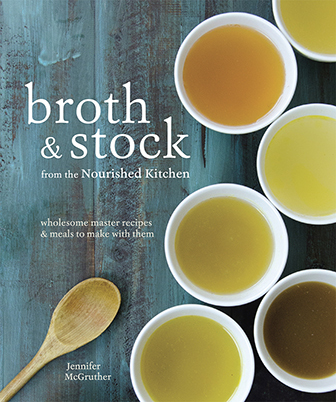 Make sure to use a homemade stock, if you can, as a good bone broth is a powerhouse of nutrition – imparting bone-building and adrenal-supporting minerals, and it’ll make your skin positively luminescent (taken along with a bit of cod liver oil and plenty of healthy fats and green vegetables). Gratins are traditionally prepared in a large, shallow, oblong stoneware dish. I found mine secondhand at our local thrift store, but if you’re stuck, you can find them online. This recipe should be prepared using a 14-inch (approximately 3-quart) gratin dish which you can find here. 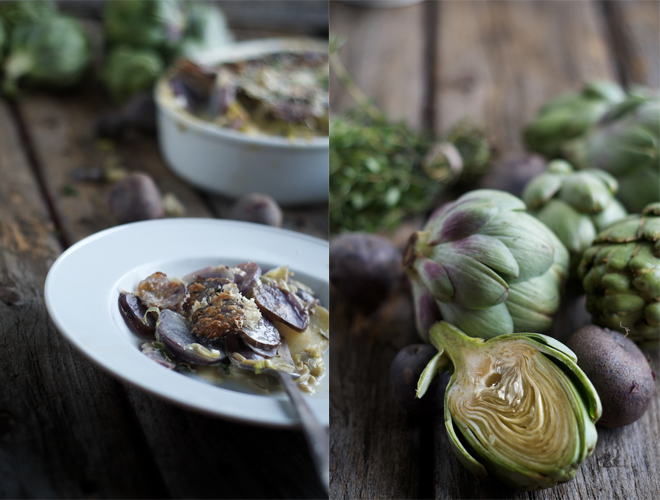 In mid-summer when the first potatoes appear and fresh artichokes are at their best, I like to prepare this simple potato and artichoke gratin. If you're not using whole artichokes, simply substitute artichoke hearts and omit step #2. Preheat oven to 400 F, and set a large pot of water to boil. When the pot of water comes to a boil, drop in artichokes and boil until tender. Remove from the water and allow to cool until comfortable enough to handle. Trim away tough leaves to expose the heart. Remove the choke with a spoon and finely chop the artichoke heart, stem and any tender leaves. Melt butter in a skillet over medium heat. 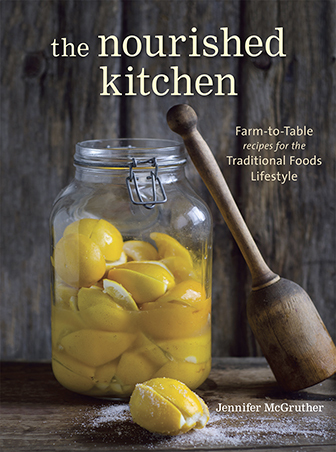 When it froths, stir in leeks and chopped artichokes, sauteing until fragrant and tender - about five minutes. Layer the bottom of a gratin dish with a ⅓ of the potatoes, top with ½ of the leeks and artichokes, sprinkle with ⅓ of the thyme and continue layering, ending with a layer of potatoes. Whisk cream, chicken stock, salt and pepper together in a small mixing bowl and pour over the layers of vegetables. Top with grated cheese and a final sprinkling of thyme. Bake for 1 hour or until potatoes are tender and the gratin is nicely browned. Allow to cool 5 to 10 minutes before serving. This looks delicious; artichokes are a favorite food around here but I never thought of pairing them with potatoes. Perfect for all of the new potatoes that just came out of the garden – we have white, gold, red, purple, and blue potatoes! Yay! 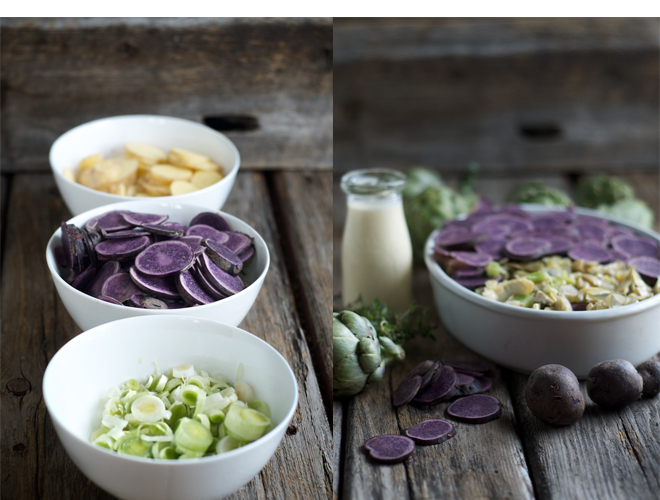 I just picked up purple potatos at the farmer’s market and was wondering what to do with them – this looks awesome! Only the hearts? When I cook artichokes, we serve the leaves as an appetizer — my husband uses my Hurricane Dressing, which is a spicy oil and vinegar dressing, and I like melted garlic butter. We set out the cooked artichokes, stem end down, in a bowl set on a plate, and peel the leaves, one at a time, dip them into the dip of choice, and then place the leaf between your front teeth and scrape the tender pulp off the top of the leaf. Place leaf on the plate, and repeat, until you reach the choke, and can scrape it off the heart with a spoon… and then cut the heart for your dish above, or eat it! Sounds yummmmmy! @Marilyn: What is recipe for Hurricane Dressing? That sounds good too! What a beautiful dish, and I love how you give such detailed instructions — even where to get gratin dishes! Fantastic. This sounds awesome!!! Looking delish. This looks great! Is it GAPS friendly? I’m not familiar with purple potatoes. I hope someday to graduate from my potato-freshman steamin’ excitement to whipping up something real and delicious like this. I’ll have to smuggle in artichokes from the Marin farmer’s market in my carry-on but it won’t be the first time I’ve smuggled fresh-picked veggies from one coast to another. And when I do…watch out! This recipe sounds wonderful. I’d like to use it as a side dish for pan seared duck breast with a bitter orange and bourbon sauce. Can you tell me how many servings it will make as written, using it in this way? Thanks.